VANCOUVER — Jonathon Jennings looked left, then over the middle, and finally to his right. With no one open, the pocket collapsing and his mental clock ticking down, the quarterback for the B.C. Lions chose to try and go it alone. "It was crazy. I went through so many different reads," said Jennings. "Nothing was there." Jennings broke a tackle from hard-hitting Winnipeg safety Taylor Loffler to score his second rushing touchdown of the fourth quarter on a gutsy nine-yard scamper with 66 seconds left as the Lions came back to defeat the Blue Bombers 32-31 on Sunday in a wild CFL West Division semifinal. B.C. trailed 25-6 just before halftime after Jennings was intercepted on the second play from scrimmage and then fumbled deep in Winnipeg territory, but the second-year QB rallied his team with a performance worthy of a veteran. "I can't explain it," said Lions wide receiver Bryan Burnham. "It's so surreal watching him out there playing. "Some of the things he does ... I mean that last play was amazing." Winnipeg was still alive after the Lions' two-point conversion attempt that would have put the hosts up by three failed, but rather than go for it on third and four from the B.C. 53 with 36 seconds left, the Bombers elected to try a 61-yard field goal from Justin Medlock that came up well short. "We could have folded," said B.C. defensive back Ryan Phillips. "We kept fighting. I think that speaks volumes for how this year has been. "We've had some down times, we've had some high times, and we experienced all of those in this one game." Jennings finished 26-of-35 passing for 329 yards with touchdown tosses to Burnham and Terrell Sinkfield for the Lions, who will play the Calgary Stampeders in next Sunday's West final. Jeremiah Johnson rushed 11 times for 110 yards and scored other B.C. 's TD on the ground, while Paul McCallum added two converts. "I'm proud of our team," said Jennings. "Everyone's proud of each other. We found a way." Matt Nichols was 26 of 40 with touchdown passes to Ryan Smith for the Bombers, who returned to the playoffs for the first time since 2011, but were left disappointed after scoring just six points after halftime against a team they beat twice last month in the regular season. "Credit to their defence," said Nichols. "Going against a high-powered offence like that, you know you have to score points to win. "They did a good job and we didn't do enough." Andrew Harris carried 11 times for 61 yards and a touchdown against his former club, while Medlock added three field goals, three extra points and a kickoff single. Smith had seven catches for 106 yards, and Weston Dressler caught three balls for 98 yards. "They did a good job of stopping the run," said Harris. "They did a good job in filling those gaps. I've got to credit that defence." Winnipeg led by nine after three quarters and went up 31-19 early in the fourth on Medlock's third field goal from 27 yards out, but the Lions marched back down the field with under seven minutes to go, with Jennings finding Sinkfield from six yards out to make it 31-26 after the extra point. B.C. 's defence then forced a Winnipeg punt before the offence drove down the field for the winning score as the Lions won in the post-season for the first time since their 2011 Grey Cup victory over the Bombers. "You look at the first half, it almost felt like the stage was too big," said B.C. head coach and general manager Wally Buono, who improved to 23-15 in the playoffs. "But at halftime we focused on what was important." Up 25-12 after two quarters, the Bombers increased their advantage to 16 early in the third when Medlock, who made a CFL-record 60 field goals this season, hit from 37 yards out. The Lions responded on their next series with Jennings running in from eight yards on a play that was set up by an unnecessary roughness penalty on Loffler after he levelled Emmanuel Arceneaux, who stayed down and did not return. McCallum's convert made the score 28-19 heading to the fourth. Arceneaux was in the locker-room as teammates celebrated after the game, but was using a crutch and confirmed to reporters he suffered a concussion. "We used that as a little bit of fuel to fire us up," said Johnson. "That was a most unnecessary hit. It's their fault. "They woke up a beast." The Bombers lived and died on turnovers in 2016, finishing plus-29 to top the league by a wide margin, and picked off Jennings early when Chris Randle stepped in front of Arceneaux and returned the ball 10 yards to the Lions' 45. Winnipeg drove down the field from there, with Harris bowling over the goal-line from four yards and led 8-0 after Medlock's convert and a single on the ensuing kickoff. B.C. started to get things going on its third drive, but another turnover did them in deep in Winnipeg territory when Maurice Leggett sacked and stripped Jennings, leading to Medlock's 18-yard field goal for a 11-0 lead. Jennings finally got things going in the second when he hooked up with Burnham on a 13-yard touchdown, but the two-point conversion attempt fell incomplete. The Bombers responded later in the quarter when Nichols found Dressler for a 60-yard catch before Smith caught a 27-yard touchdown on the next play. 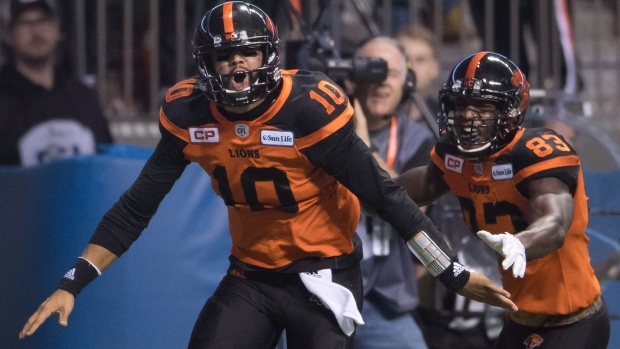 The visitors then went up 25-6 on Smith's 34-yard touchdown grab on Winnipeg's next drive, but Johnson galloped for a 40-yard TD run late in the half to give the Lions a spark. "In June, who picked the B.C. Lions to do anything other than finish last in the league?" said Buono. "If somebody had us picked higher than that, I'd be surprised."